Software development is always subject to change, especially change the interface of the application code because the interface is the part that interacts directly with the user, and that is the fundamental to the user for ease of use applications. With the changes, it will display the potential for a change also in the other and it will make the system more complex and complicated. 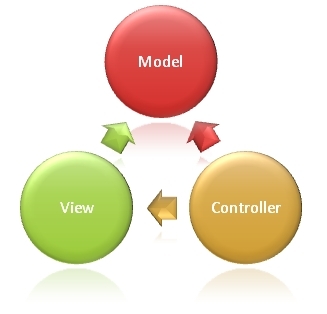 To solve the problem, Introduce an architecture or pattern called Model View Controller (MVC). Model View Controller (MVC) is a pattern that can build more effective software project because it is done by sorting the components between the Model, View and Controller. By implementing MVC in building an application will impact on the ease of the application when the maintenance phase. Process development and integration became easier to do. The basic idea of ​​MVC is actually very simple, which is trying to separate the model, view, and controller. Placement details of data and operations in a given area so as not spread to the entire scope of the application. Reuse of application of the model by other applications due to the separation of the data interface. Facilitate the incorporation of design in the development team. Availability of multiple interfaces in applications. Component view can be designed without having to pay attention to other parts of the excess. Clear separation between presentation logic and business logic. Although many advantages of being owned by the MVC, but there are still a lot of side effects produced. These side effects are an increase in applications complexity so small that does not require loose coupling on the block barrier model in MVC pattern itself.